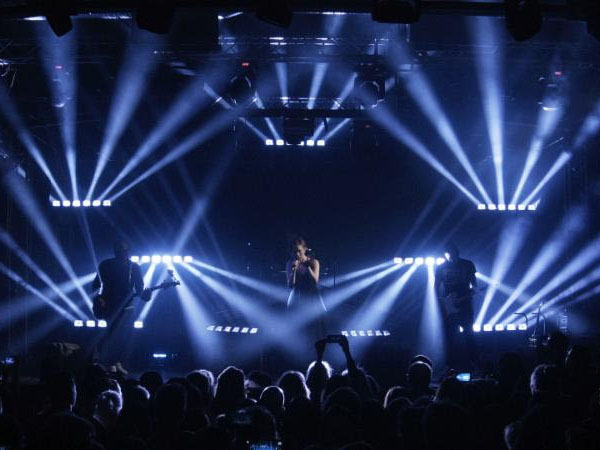 Claypaky’s SharBar, the LED-based multi-beam effects light fixture, has been used to great effect on a live concert by popular Russian band, My Michelle, at the Volta Club, Moscow with lighting design by Russian designers David Misakyan and Dmitry Buryak. Led by singer-songwriter Tanya Tkachuk, the band has enjoyed great success across Russia with its modern, soulful pop sound. For the Volta Club concert, My Michelle’s producer, Pavlo Shevchuk, worked with Misakyan and Buryak to create a ‘cool, club show’ feel for audiences. The design played to the venue’s compact 8m x 6m stage area, with a height of just 4.85m overhead to the stationary truss structures. Misakyan explained, “When we thought about the production design we wanted something more than just truss warmers and colour washes . . . we needed a fixture suitable for dance pop-music, which would look good in a small club setting. Coincidentally, at that time I was contacted by Aleksey Zhuravlev from Russian rental outfit Global Show Trade (GST) who provided the fixtures for the My Michelle show. Aleksey asked if I was interested in using any new Claypaky SharBars on any projects. This was some luck . . . of course I was interested! Consisting of a moving bar of six 30W Osram Ostar RGBW LED luminaires, the SharBar has a 240° tilt range. Each of the six luminaires features an individually controllable motorised zoom which can narrow the beam angle to a minimum of 2°, while an internal double mirror system allows each of the six beams to be directed separately. Six Claypaky Mythos projectors, positioned on the floor upstage, complemented the SharBars providing powerful backlighting effects. Misakyan admits to having doubts about the SharBar’s ability to hold its own in such surroundings, but his fears were unfounded.